OK... so here is the tutorial. Becuase there are so many pictures, I created the tutorial on my website. You can find it here! Just so you know, you will need Mini Glue Dots, scissors and ribbon. Last week's Color challenge was Certainly Celery, Elegant Eggplant, and Orchid Opulence. Well, I got this card made on Thursday... But this is the first chance I have had to post it. Better late than never, right? For this card, I used the hostess stamp, "From the Garden". I stamped it in Basic Grey ink and used my watercolor crayons and an Aqua Paitner to color it. 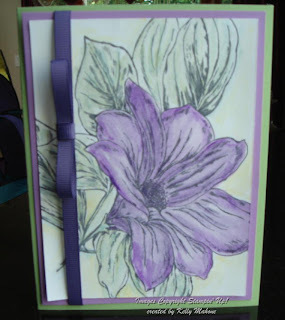 It is layered on Orchid Opulence then on a Certainly Celery card. The ribbon is Eggplant grosgrain. The bow is a Faux Bow. I will post a tutorial for you on how to create this bow later today! Plus, check back later this week for the current color challenge. This week the colors are Ruby Red, Night of Navy and Brocade Blue. Play along with me and email me a pic of your card. I would love to post it here!!! Ok... so I have been blog stalking for so long and wanted to start my own. But, ya know I worry about not updating it and I worry that, oh, about everything.... well, I decided to stop worrying about it and to just do it! 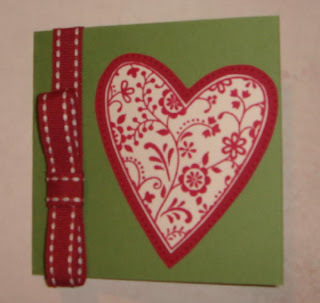 So I hope you will check back often and see some new stamping and cardmaking and scrapbooking! These are the things that I love! In the next few days I will get some pictures loaded and lots of new and exciting things to share with you! !